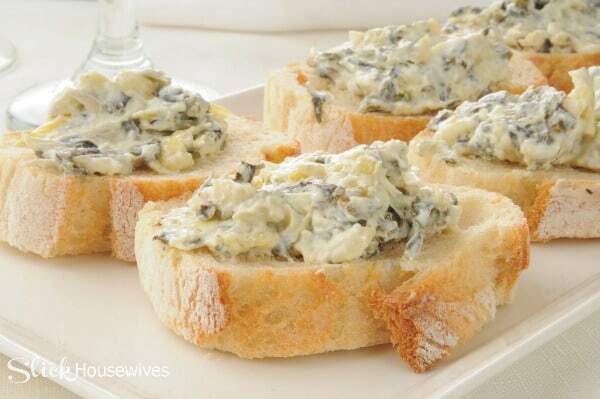 I love whipping up this Skinny Spinach Artichoke Dip whenever we are planning a get together at the house. 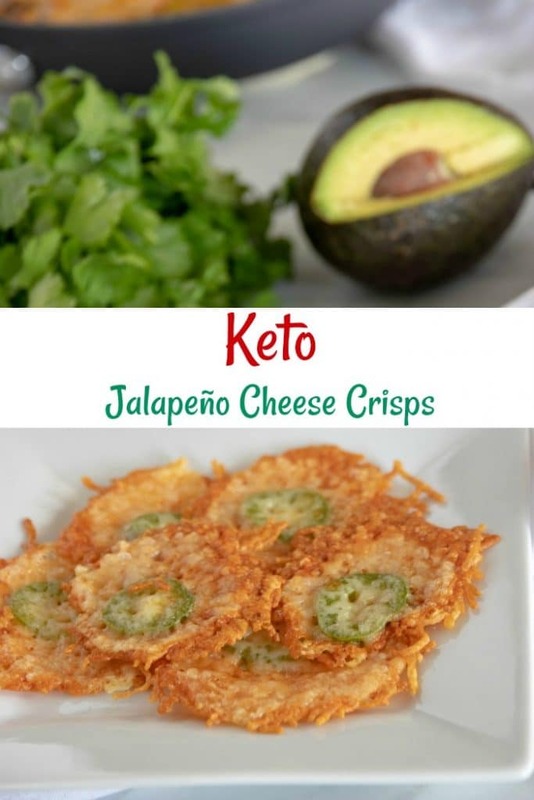 It’s really easy and tastes fantastic! No one will ever know that this is a low-fat “skinny” version! I like to pair it with yummy pita chips, toasted bread or just regular crackers. I love how my children will eat it up and never question the fact that there is spinach in it! Spinach is an excellent source of vitamin K, vitamin A, magnesium, folate, manganese, iron, calcium, vitamin C, vitamin B2, potassium, vitamin B6 and many more great perks! If you enjoy this Spinach Artichoke Dip Recipe, make sure to try our Charleston Cheese Dip and Easy Buffalo Chicken Dip Recipe! 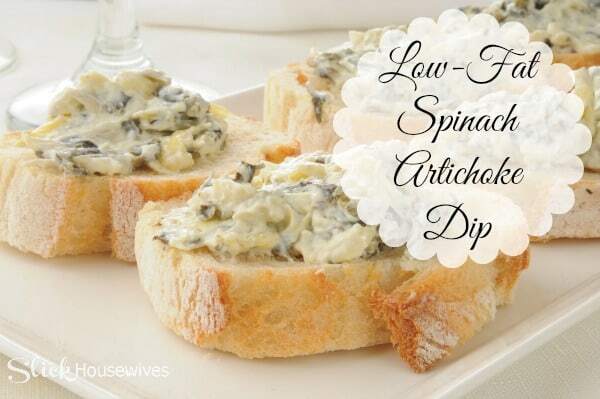 This low fat Spinach Artichoke Dip is a crowd pleaser for sure! Hope you enjoy! 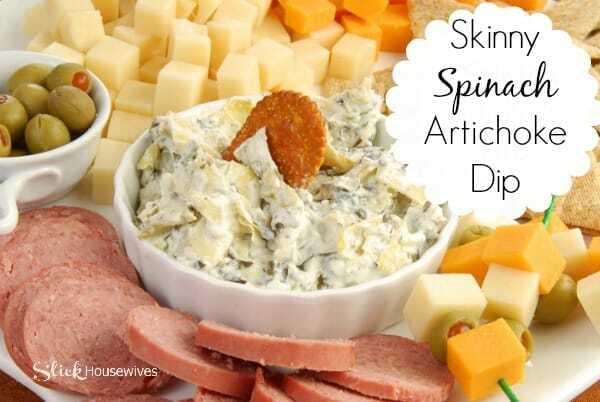 **TIP: I like to use a Crock-Pot Little Dipper for dips like this Spinach dip. It’s great for when you are entertaining or just want an easy way to serve your dip while keeping it warm. In a food processor, add the artichokes and chop until the artichokes are broken into small chunks. Pour the artichokes out into a mixing bowl. Blend the cream cheese, Parmesan cheese, garlic powder,1/4 cup low fat mozzarella cheese, skim milk and salt until smooth and creamy in the food processor and scrape the mixture into the mixing bowl with the artichokes. Add the chopped spinach to the bowl and mix together until everything is thoroughly combined. If you want the spinach to be chopped into even smaller pieces, toss it in the food processor and chop until it is chopped to your liking. Bake for about 15-20 minutes or until thoroughly heated. Remove from the heat and sprinkle with the rest of the mozzarella cheese. Allow to sit for about 5 minutes and serve. 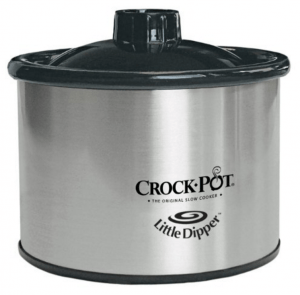 If using a mini Crock-Pot, cook for 1 1/2 hours. Sprinkle mozzarella on top during the last 10 minutes. If you enjoyed this Skinny Spinach Artichoke Dip make sure to check out our Charleston Cheese Dip recipe that is very popular on the site! Artichoke dip is one of my favorite dips to serve at our family parties. Thanks for sharing your recipe at our Pinterest Foodie party! This recipe doesn't say when to add the milk. Sorry about that Kim! I updated the recipe!